Bye bye plastic bags in Los Angeles!!! Thank you LA for finally stepping up to the plate. On July 1st, plastic grocery bags will be banned in unicorporated areas of Los Angeles County. 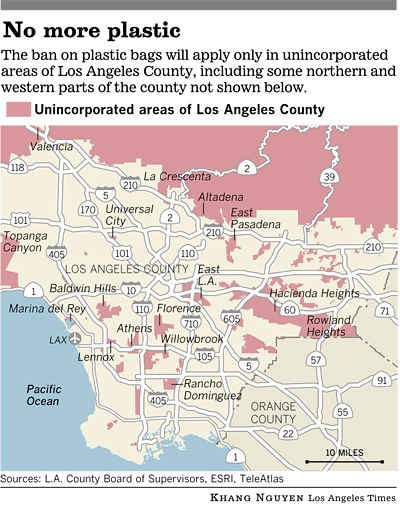 This will effect about 1.1 million people who live in unincorporated cities of LA. The ban will take place in such cities as Rowland Heights, Hacienda Heights, Altadena, La Crescenta, Topanga Canyon, Marina del Rey, Baldwin Hills, Athens, Willowbrook, Florence, Rancho Dominguez, Valencia, East Pasadena and East Los Angeles. If you’ve ever driven around LA, you’ll notice that plastic bags are stuck in trees next to the sides of roads and freeways. Also known as “urban tumbleweeds.” No wonder Katy Perry sang, “Do you ever feel like a plastic bag, drifting through the wind?” in her Firework song. 67 large supermarkets, as well as pharmacies, will no longer be providing customers with disposable plastic bags. WAHOOO FINALLY! Everyone grab your reusable bags and save the planet- one plastic bag at a time. This is such a great step for California, I’m hoping Texas will follow….